Quite a few Big Data applications have been recently developed for a variety of complicated and large-size enterprise solutions in several domains. Despite their multifaceted functionality suited for data-intensive processing, these large-scale applications exhibit inherent complexity and unconventional behaviors, resulting in some unique challenges and constraints on their usability, performance, security, reliability, responsiveness and scalability. The reality is that a vast majority of these Big Data solutions were constructed in an ad-hoc fashion, leading to many issues and barriers of quality, delivery, operations and maintainability. Certain distinguishing characteristics of Big Data development demand special considerations and methodical undertakings in a cross-disciplinary manner. 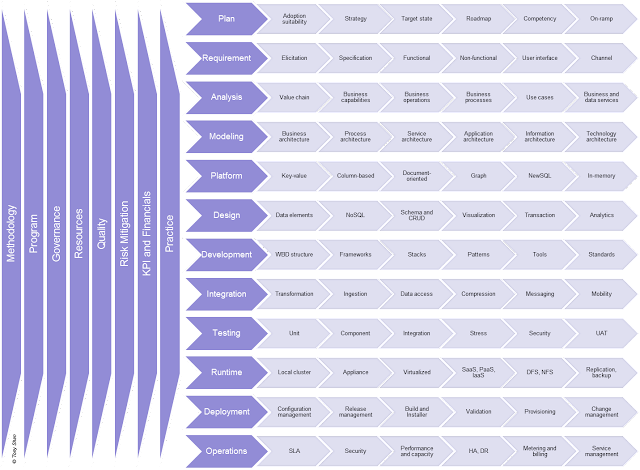 Big Data Engineering (BDE) is defined as the practical application of a systematic, disciplined, quantifiable approach to the analysis, design, construction, operation, and maintenance of Big Data solutions. BDE is a holistic method focusing on 8 crucial areas: Methodology, Program, Governance, Resources, Quality, Risk Mitigation, KPI & Financials, and Practice. 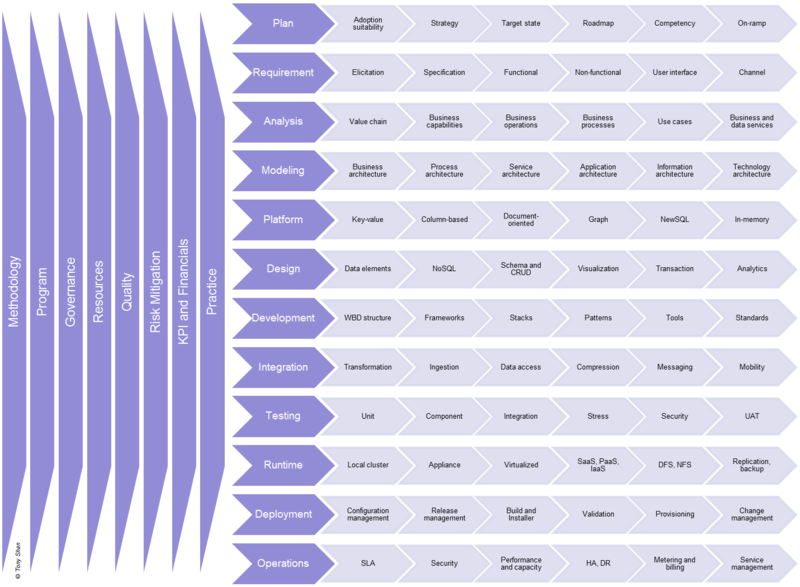 BDE also systematically addresses the lifecycle of Big Data solutioning in 12 stages: Plan, Requirement, Analysis, Modeling, Platform, Design, Development, Integration, Testing, Runtime, Deployment, and Operation. Each of these 12 stages comprises individual elements as subdisplines, as illustrated in the following diagram (Figure 1). For example, the NoSQL platform options include key-value, column-based, document-oriented, graph, NewSQL, and In-memory stores. The details of the artifacts in BDE are covered in a comprehensive toolkit built to facilitate the use of BDE in real-world projects for practitioners. You may email the author for additional contents. For more information, please contact Tony Shan ([email protected]). ©Tony Shan. All rights reserved. Tony Shan works as a senior consultant, advisor at a global applications and infrastructure solutions firm helping clients realize the greatest value from their IT. Shan is a renowned thought leader and technology visionary with a number of years of field experience and guru-level expertise on cloud computing, Big Data, Hadoop, NoSQL, social, mobile, SOA, BI, technology strategy, IT roadmapping, systems design, architecture engineering, portfolio rationalization, product development, asset management, strategic planning, process standardization, and Web 2.0. He has directed the lifecycle R&D and buildout of large-scale award-winning distributed systems on diverse platforms in Fortune 100 companies and public sector like IBM, Bank of America, Wells Fargo, Cisco, Honeywell, Abbott, etc. Shan is an inventive expert with a proven track record of influential innovations such as Cloud Engineering. He has authored dozens of top-notch technical papers on next-generation technologies and over ten books that won multiple awards. He is a frequent keynote speaker and Chair/Panel/Advisor/Judge/Organizing Committee in prominent conferences/workshops, an editor/editorial advisory board member of IT research journals/books, and a founder of several user groups, forums, and centers of excellence (CoE).